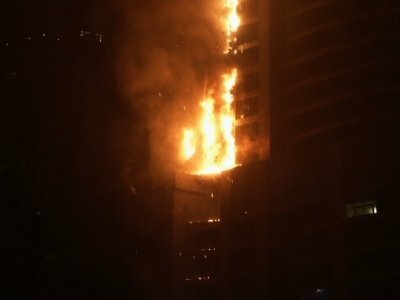 DUBAI, United Arab Emirates (AP) — Police in Dubai reopened the streets around one of the world’s tallest residential skyscrapers after firefighters put out a blaze that erupted early Friday in the high-rise, forcing residents to evacuate in the middle of the night and sending chunks of debris plummeting below. No major injuries had been reported in the tower, located in an upscale waterfront district heavily populated by expatriates from around the world. A few people were treated for smoke inhalation, according to Dubai’s Gulf News website. Several residents said the fire broke out just after 1 a.m. at the 87-story Torch Tower — a more than 1,100-foot-tall (335 meters) residential building in Dubai’s Marina district. The tower has 676 apartments — 38 of which were burnt and destroyed by the fire, according to the official Dubai media office. Sixty-four floors of the facade of the building were also burnt, they said. The same building had also caught fire just two-and-a-half years earlier. The cause of the fire on was not immediately known but in the past, such infernos in Dubai have been linked to highly flammable building cladding — as was the devastating June tower fire in London that killed at least 80 people. Aletomeh, a sales manager, said he moved to the Torch Tower just three months ago, snagging an apartment on the 54th floor of the luxury tower. He said he was coming home after midnight when building security guards told him to remain in the street because a fire had erupted. He said his roommate grabbed their passports and that it took him more than two hours to come down the stairway because of the rush of people trying to get out at the same time. At least one woman passed out in the stairway, Aletomeh said. Nearly the entire length of the building on one side became engulfed in flames at one point during the blaze as residents looked on from below, many in tears. The firefighters battled the blaze for more than two hours. Officials say 84 floors of the building are residential and three are for services. Dubai’s Civil Defense announced at about 3:30 a.m. that firefighters had brought the blaze under control and said cooling operations were underway. Authorities shared video of the building from the outside later on Friday, showing the entire length of the tower charred on one side. By midday Friday, a few police cars could be seen in the area, but the main streets around it were open to traffic and had been wiped clean of debris, some of which had fallen on cars parked below. The skyscraper, however, remained closed to residents. Officials said they were providing shelter at three nearby hotels for residents. By nightfall, residents still had not been told when they would be allowed to return to check on their apartments. The Torch Tower previously caught fire in February 2015; there were also no casualties reported in that blaze. In both incidents, fire alarms alerted residents and building staff knocked on doors to ensure evacuation. Kingfield Owner Association Management Services, which manages the tower, did not provide any details about the cause of the blaze in a brief response to questions. “The safety of all residents and staff is of the utmost importance, and our efforts are currently focused on arranging the necessary emergency accommodation for residents,” spokeswoman Anel-Carline Beukes said without elaborating. The tower was built by developer Select Group and opened in 2011. Select did not respond to requests for comment. Aletomeh, who is now staying with friends, said towers like the Torch should have sprinklers. He wondered why Civil Defense crews did not deploy helicopters to try and extinguish the fire quicker. “Putting out the fire was the most important thing, which took them so long,” he said. Simon Bach, a New Zealander who lives in a high-rise across the street, told The Associated Press he saw a few policemen as well as Emiratis in traditional white robes helping people get out. About 10 to 12 firetrucks arrived quickly on the scene, he said. He said just as the firefighters had seemed to bring the blaze under control, falling debris ignited a part of the building further down. And on Thursday evening, in the neighboring emirate of Sharjah, an under-construction tower caught fire that raged for several hours as local media and nearby residents posted dramatic images of the blaze. While the new regulations are now in place for construction in Dubai and other cities, it’s unclear how authorities will force owners to replace flammable siding with better material. The tragic June inferno in London prompted Britain to order more thorough testing on the cladding systems of its towers. Associated Press writers Adam Schreck, Kamran Jebreili and Malak Harb contributed to this report from Dubai.